Extinguishing a Camp-fire Properly - Haba Naija! If you are lucky enough to be somewhere that camp-fires are allowed for cooking rather than using a camping stove then it is your responsibility to ensure it has been properly extinguished before you leave. It is quite amazing how resilient one tiny burning ember can be and putting out a fire can often take more work than getting it going in the first place. When you are camping there is no need to build a huge roaring fire. Small, well contained fires are easier to build, maintain and extinguish and provide enough heat for staving off the evening chill, cooking and roasting marshmallows. Plan ahead – you will need to start thinking about burning down your fire a little while before you intend to completely extinguish it. 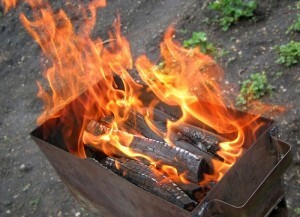 It is easier to ensure a fire is put out properly once it has burned to ash and small coals. If you unexpectedly have to extinguish a fire before this stage then spread out the logs or larger sticks as much as possible then scrape them free of any obvious burning embers. First douse – you will need quite a bit of water to douse the fire but start with a small amount and build up gradually to stop ashes flying up. Once you have poured a substantial amount of water on in this way give everything a good stir with a stick to ensure any buried embers get wet too. Aim for a gooey mess and you are on the right lines. If you still had some larger logs burning then they will need several heavy dousing to ensure they are wet through and their unseen interior isn’t still smouldering. Second douse – pour more water on the fire. If you can still hear any hisses it means that somewhere in that gooey mess or buried out of sight are hot embers which need attention. Spread it out – use a large stick or spade to spread out all the fire remains. Knock larger lumps down to tiny pieces. Turn them over several times and let everything stay loose. Don’t pack the remains down – this would serve to help maintain any burning embers rather than stifling them. Wait – leave everything for a minimum of ten minutes and then use your hand to feel for any hot spots. If you detect any heat at all after this time then the fire is not extinguished and you will have to repeat the steps above. If you are in any doubt as to whether or not the fire is extinguished just keep dousing and spreading the ashes. If your fire was a large one with a deep bed then you may have to dig down a bit to ensure that there are no hidden glowing embers underneath.It is possible to extinguish a fire just using earth but unless you know what you are doing you are more likely to protect burning embers which will continue to smoulder long after you have gone. If you have any gathered firewood left then it is both acceptable and courteous to leave it for the next person, particularly in places where camping is common. In many countries it is an unwritten law that failure to leave a wood supply for the next person is extremely bad manners. It seems that an adverse law of camping states that even the most reluctant fire to get started may prove even more reluctant to extinguish (annoyingly, this same adverse law applies if you are trying to bank a fire to keep it in overnight but for the opposite reasons). Although the UK doesn’t present the same high risks of bushfire as other countries, an improperly extinguished camp-fire can still lead to disaster, not least of all for wildlife. Open fires are not just the heart of any home – they are the epitome of idyllic camping. Help ensure that this tradition stays alive in the UK by acting responsibly.